The thing about long distance travel by car, particularly on the Interstate system, is that you can wind up seeing the same vehicles again and again. This is expressly true with trucks. You pass some truck hauling something and leave him behind. He's driving 65 but you can drive 70. You math whizzes can figure out just how long it will be before you're a good 10 miles ahead of him, assuming a steady state of driving. Then, you pass a rest stop sign and realize the two bottles of water you consumed are sloshing about in your bladder so you pull over. In the time it takes you to zip up the windows, lock the Jeep, walk to the rest room, use the rest room, dry your hands without wiping them on your pants (See below. ), walk back to the Jeep, unzip all the windows, start the Jeep and drive out of the rest area, the truck you passed many minutes before, has passed you. If he's going the same direction you are, this dance can play out several times in the several hours you travel the same road. Gas and food also allow the truck to get ahead of you. And then you have the trucks that drive 70-75 on the Interstate or you find yourself behind the 1975 panel van which, you swear, has an engine comprised of 6 raccoons on treadmills because they ... just ... aren't ... going ... real ... fast. I caught up and passed this guy then stopped for lunch. I caught up and passed him again and then found myself in the middle of a stream of cars behind a motor home. He roared past me and I never saw him again. 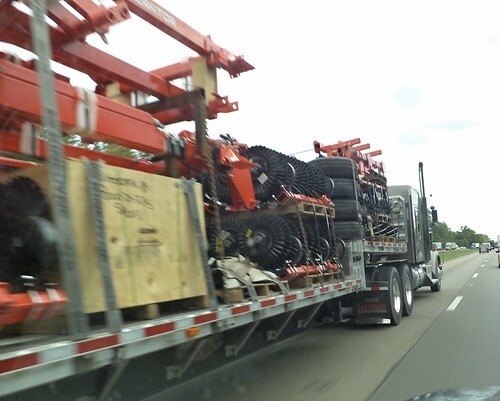 The first time I passed him, I wasn't sure what this was that he was hauling. The second time, he was stuck in a line of cars, only going 60, so I had the chance to look at the cargo. Ah, I know what this is. When he roared past me the third time, I was ready. I'm not going to tell you. My mother might know but the only clue I'll give is that some assembly will be required once this reaches the final destination. They also come in green and those are made by John Deere. I think you are the only woman - beside me - that loves to look at all the stuff these lovely boys haul across the roads. For me it's a professional deformation, being a trucker, but what is your excuse??? Don't get me wrong; I love these posts!! I see things that are interesting to me. And, for those wondering, that's a discing machine.